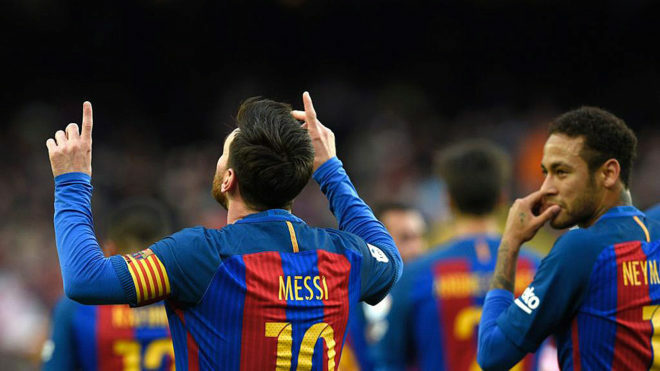 A heavily rotated Barcelona still took care of business with a 3-0 victory over Athletic Bilbao on Saturday afternoon at the Camp Nou. 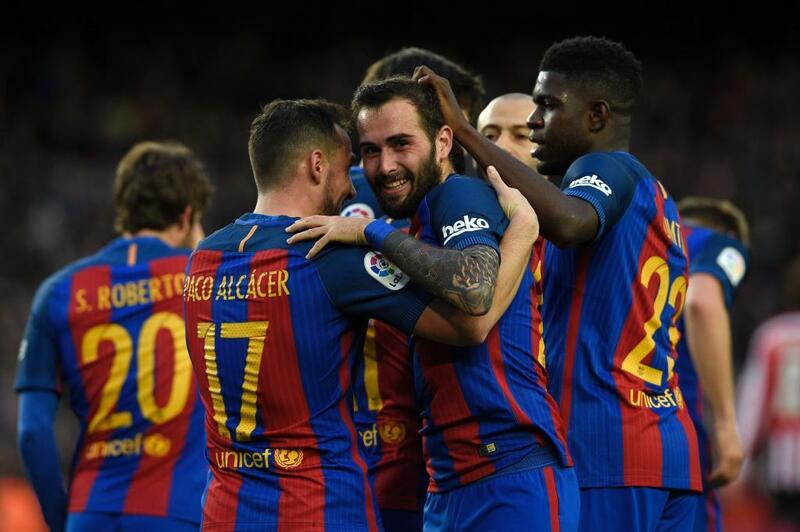 Paco Alcacer scored his first league goal of the season, while Lionel Messi unsurprisingly added his name to the scoresheet, as did Aleix Vidal, in a match in which Barcelona displayed strong finishing to claim the three points. Even though he did not score, mention must be made of Neymar’s performance. Not only did the Brazilian generate much of the Barcelona offense, but his dedication to tracking back and defending was a major asset on the day for manager Luis Enrique, especially with so many usual starters out of action. Athletic pressured the hosts well, with Inaki Williams standing out in particular, but a failure to capitalise on chances plus good goalkeeping from Barcelona’s Marc-Andre ter Stegen condemned Ernesto Valverde’s men to a goalless outing. For the first time in 2017, Alcacer got the nod from Luis Enrique in a starting XI, joining Messi and Neymar up front while Luis Suarez was rested on the bench. With Sergio Busquets and Andres Iniesta still out injured, the midfield was totally revamped as Andre Gomes, Rafinha and Arda Turan formed the middle trio, while in the back Vidal enjoyed a second straight league start at right-back and Jeremy Mathieu was placed on the opposite side at left-back. There were fireworks at both ends to start, first on a Neymar shot that just trickled wide after Yeray had slipped right in front of goal; then a fine play from Williams who set up Raul Garcia only to see the shot bounced off the post. The end-to-end action continued and moments after a Barcelona run into the area, Athletic countered with one of their one in which Aymeric Laporte picked out Williams all alone in front of goal but the header from the forward sailed wide. Athletic would end up ruing the missed chances as Barcelona would find the 1-0 opener thanks to a fine finish from Alcacer. Aleix Vidal swung a cross-field pass over to Neymar on the left and the Brazilian showed the best of his playmaking skills by darting past Mike San Jose before cutting back for Alcacer, who banged in a one-timer inside the near post. Barcelona were still plagued by errors though due to Athletic’s high pressing and they were lucky that Raul Garcia and San Jose did not take better advantage of a couple giveaways deep in the hosts’ half. Williams was also giving the Barcelona defence fits; he blazed past Gerard Pique on the left edge of the area around the half-hour mark, but Ter Stegen blocked the narrow-angled shot. Just when it looked like Athletic were good value for an equaliser, Barcelona doubled the margin on a Messi free kick that left both Raul Garcia and Athletic goalkeeper Gorka Iraizoz blushing. From a very slim angle on the right wing, the Argentine hit a free kick that curled past a two-man wall and then Raul Garcia before sneaking in past the wrong-footed Iraizoz at the near post for a 2-0 lead. Neymar then came inches away from a third for Barcelona right before half-time, but the shot from the left rolled wide of the far post. 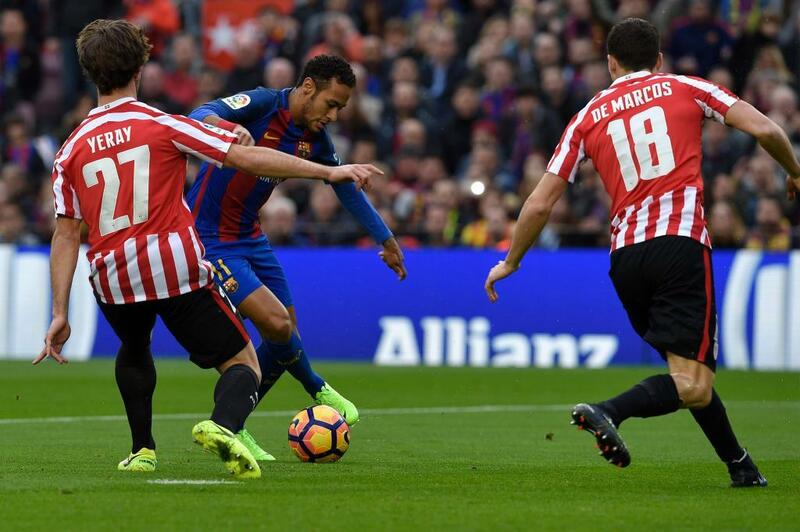 It would be the final chance of a first-half in which Athletic went toe-to-toe with the home side, yet trudged incredulously to the dressing room facing a two-goal deficit. An injury forced Gerard Pique off during intermission, with Luis Enrique swapping off the lanky centre-back for Javier Mascherano, but the Athletic attacks kept coming. 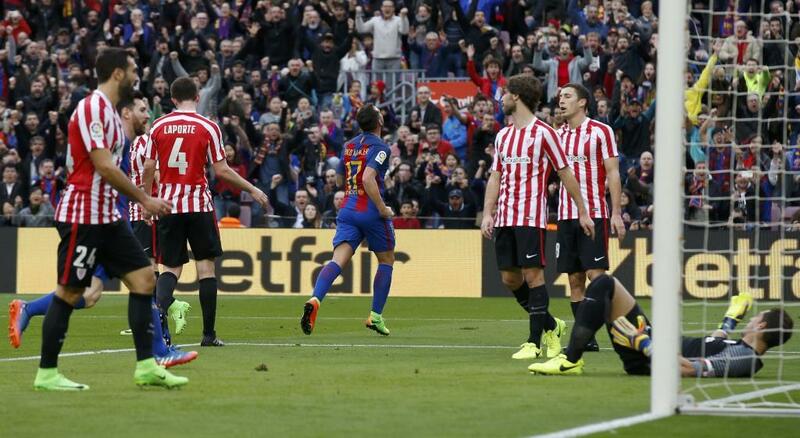 And with renowned Barcelona killer Aritz Aduriz coming on the pitch early in the second stanza, the two-goal lead was far from safe. The Camp Nou then witnessed one of the more rare events in football: Messi getting substituted. Presumably to rest La Pulga ahead of next week’s Copa del Rey return leg, Luis Enrique took Messi off just after the hour mark and replaced him with Sergi Roberto. With Messi off the pitch, Athletic smelled an opportunity but they would be left stunned minutes later when a sensational solo effort from Aleix Vidal ended with the full-back clubbing a left-footer that bounced past Iraizoz and into the side netting for a 3-0 advantage. The Vidal goal deflated Athletic and the match lost much of its energy in the final 20 minutes with the outcome all but decided. Eraso had the Basques’ best look at goal late on when played in, but he shot wide of the far post, summing up Athletic’s lack of finishing on the night. Barcelona return to action on Tuesday when they face Atletico Madrid in their Copa del Rey semi-final second leg at the Camp Nou. 3.- FC Barcelona: Ter Stegen; Aleix Vidal, Pique (Mascherano, min. 46), Umtiti, Mathieu; Andre Gomes, Rafinha (Rakitic, min. 54), Arda Turan; Messi (Sergi Roberto, min. 64), Alcacer, Neymar. 0.- Athletic Bilbao: Iraizoz, De Marcos, Balenziaga, Laporte, Yeray, San Jose (Benat, min. 59), Iturraspe, Raul Garcia (Eraso, min. 74), Muniain, Williams, Lekue (Aduriz, min. 52). Goals: 1-0, min. 18: Alcacer; 2-0, min. 40: Messi; 3-0, min. 67: Aleix Vidal. Yellow Cards: Pique (Min. 23) for Barcelona, Iturraspe (Min. 27) for Athletic Bilbao, De Marcos (Min. 34) for Athletic Bilbao, Laporte (Min. 70) for Athletic Bilbao.